The Workers’ Party presidential candidate in Brazil’s upcoming elections, Fernando Haddad, visited his fellow party member and ex-president Luiz Inácio Lula da Silva on Monday. After their meeting, Haddad spoke with journalists about the former president’s insights on recent voting intention polls, saying Lula is not willing to trade his dignity for his freedom. Lula has been in prison since Apr. 7, and was barred from running for office by the country's top electoral court. According to Haddad, opinion poll results meet Lula’s expectations. He was pleased with the latest surveys released by pollsters Datafolha and CNT. The Workers’ Party candidate now has 17.6 percent of voter support, outperforming centrist candidate Ciro Gomes and now securing him the second place in the race. “Our internal polls are also very positive, but [Lula] said we cannot get carried away by polls. We have a lot of work ahead of us, it’s three weeks [before the elections]. Polls are a picture, they are important, but they are not what should drive our campaign. Our campaign must be driven by proposals, by the respect to democracy, by the strengthening of institutions, and respecting our rivals,” Haddad said. The candidate pointed out the two primary pillars of his platform, employment and education. Some of the measures Haddad mentioned that should be taken to create jobs include a tax reform to increase the income available for middle- and low-income families, a banking reform to dramatically reduce taxes paid by borrowers, and a fiscal reform so that the government budget can be invested in big programs to create jobs. Regarding education, the Workers’ Party candidate said his top priority will be to invest in early and continuing education for teachers. Haddad said the public high school system run on the state level requires federal support and attention. He proposes that schools run by the federal administration will have to ‘adopt’ low-performance schools on the state level to promote them, arguing these and other ideas that are part of his platform were proposed by Lula. While speaking about his campaign guidelines, Fernando Haddad said that people should be able to discuss ideas for the country without fearing, but only respecting the other contenders. “It’s about reiterating the idea that we want to build a peaceful country, in harmony, focused on Brazil’s works,” he pointed out. 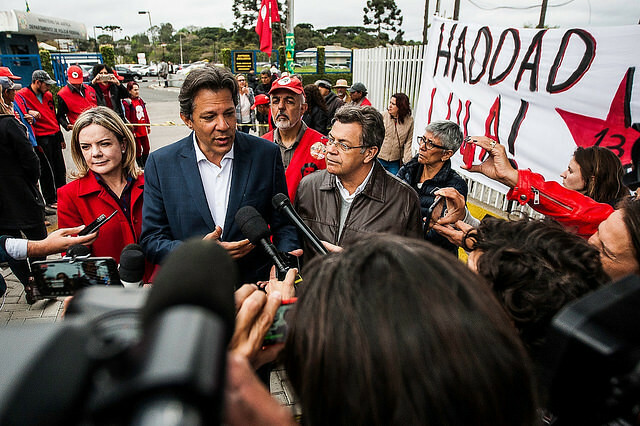 Haddad also said the United Nations should review Lula’s case in the first half of 2019.